I went to Canada, into the woods, and thought I was going on vacation. How wrong I was. I expected fun, laughter, and trees. I got all of that. Fun was had, in a variety of forms. There was laughter. 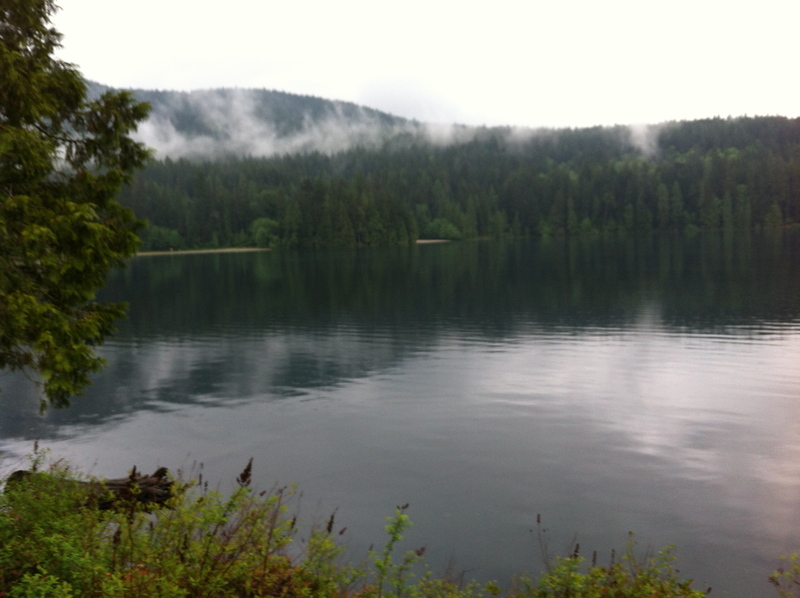 The grey mists against the deep greens of the trees and floating on the surface of the lake fed the Alaskan part of my soul. The camp site was not as spectacular as I’d hoped and the food wasn’t very good. But it was the surprises…… Oh, the surprises. The first great surprise was mead. I’d never had mead before. It seemed like every Canadian brought mead, most made their own, and it was good. One new friend is an exceptionally gifted mead maker; his pomegranate mead was divine. It made a fitting offering to the Red Goddess. I also discovered something called St. Germain, which tastes like spring flowers at sunrise. The second surprise was meeting the founder of the Pomegranate: International Journal of Pagan Studies. Many Pagans are very smart and well-read, but I wasn’t expecting to get my academic geek on. The third surprise was the rituals. I have mixed experience with ritual. Most of it bad, bland and ineffective. Occasionally, distasteful. Thankfully, the main ritual leaders, the Coru Cathubodua, come from Anderson Feri backgrounds (as do I) and so their style was familiar and welcome to me. The main ritual, while not particularly spiritually profound for me, was perhaps the best ritual theatre I have ever experienced. It was not all that elaborate, rather the simplicity of the ritual allowed the power and beauty of bodies, chant, and fire to express the heart of primal Paganism. The last ritual I attended was the Women’s Mysteries ritual. I was doubtful. I love being a female bodied, child-bearing woman, but I loathe gender essentialism and the false dichotomy that ‘women’s mysteries’ and ‘men’s mysteries’ all too often entail. I need not have worried. The ritual was beautiful, powerful, profound. I think each woman stood taller and stronger afterward. Another surprise here, besides having positive ritual experience, was that I felt the Blessed Virgin make an appearance. After such a long absence, she snuck up on me and asked that I recognize her. And then the starry crown she wore, bathed in blue, merged with the Red Goddess, and I learned of her/their power of Love. She gave me much to think about, to feel about, to sort out. Lastly, my single greatest surprise was the community. Community has long been a source of confusion for me. It is a core value for me. I am fiercely loyal and love strongly. The older I get the more I realize just how little we ever do on our own. We rise higher because of the tallest around us, and we all suffer and struggle a little more if those around suffer and struggle. But moving around makes it hard to commit. These days my strongest community are my liked minded friends, but we are spread out over the world, interacting through blogs, email and Facebook. I have missed in person connection something fierce. While I expected to meet new friends, I was not expecting to find what can only be described as a home. The Canadian Pagan community of lower BC is unlike any community I’ve ever experienced. I was overwhelmed at first. I realized, at 37, that I am introvert. It took me a full 24 hours to feel comfortable. In fact, on my first morning I sat by the fire for three hours wondering why I had come and wishing I was back at home. I felt like I had crashed a family reunion. I felt uncomfortable including myself in other people’s conversations. They all knew each other so well and were so happy to see each other. And then….. I clicked in. I inserted myself when I could. I chose a few people to go deep with. I let myself be confused. I forced nothing. While there was a certain amount of cliqueishness and some obvious snubbing (no community is perfect, sigh), I felt an acceptance that I have rarely seen at other similar gatherings. I could be as bold or as shy, as wild or as tame as I needed to be; the other attendees accepted and encouraged each person to have the experience they needed to have. I also witnessed leadership that greatly impressed me. I saw the strength of this community in their firm commitment to their vision for the Gathering, fully committed to where they’ve come from and their ideals, but equally committed to growing the community and encouraging diversity. The fact that people from as far away as Montana, Minnesota and Arizona have made this group in Canada part of their spiritual community speaks the loudest to me. I already drive 140 miles round trip each month for a tiny community of fellow students and my teachers. Now I ask myself, am I willing to drive 4 hours each way for a larger community? I don’t know if I want to commit to that. But if I choose to commit to this community, I feel like I would be welcomed with joyful, open arms. I get the strongest sense that if I choose to commit the rewards would be great. I look forward to seeing how these new relationships and connections develop and unfold in the coming months. I went into the woods, and magic was made, woven, consumed. I went into the woods and did not get a vacation, I found something far more transformational. This entry was posted in Uncategorized and tagged Feri, magic, pagan, paganism, virgin mary, witchcraft. Bookmark the permalink. It’s funny that you say the food wasn’t good, since the food was so much worse in past years that this seemed OK. But it is still humble camp food, to be sure. I know we can be a tough community to come into as a new person. We’re getting better at welcoming new people, I think, but some of us have known each other a long time, and there’s a lot of history between people… sometimes to our detriment. I hope you’ll come back next year. You’ll find yourself part of the happy “welcome back” greetings very quickly. And I hope next year we will get some time to chat, as there were some very interesting discussions around the Mysteries, for example, and I’d love to hear more of your thoughts about them. Oh, it’s on me too! I’m an introvert as well, and I tend to talk to the same people every Gathering. One way I’ve found to help myself feel a part of things is to put on a workshop or ritual. It gets me participating even if I’m feeling anxious or reluctant, and I sometimes get to meet people I otherwise wouldn’t. I may also have an ulterior motive with this suggestion: I love seeing what other people choose to bring to the table!